Following on from the phenomenal success of last year's Prom devoted to the MGM musicals – recently released on DVD – conductor John Wilson returned to lead another evening of musical theatre music. This time, it was the turn of Richard Rodgers and Oscar Hammerstein II, five of whose musicals were sampled in this two-hour concert. Perhaps oddly, Wilson elected to use the movie orchestrations rather than the original Broadway charts; although the Albert Hall is large, it seems strange to celebrate Rodgers and Hammerstein's work in the movies, where they had enormous success but were not the obvious leading names in the way they were on Broadway. The lyrics to two songs from the movie of The Sound of Music were written by Rodgers after Hammerstein's death and are not normally considered to be of the same quality as the finest of Hammerstein's lyrics, so one wonders why they were both heard here. It was also a surprise that nothing was included from State Fair, which was their only score written specially for the movies; and conversely, the decision to omit the shows that were not turned into films meant that some of Rodgers and Hammerstein's most interesting works were not sampled, including Allegro, Me and Juliet, Cinderella and Pipe Dream. 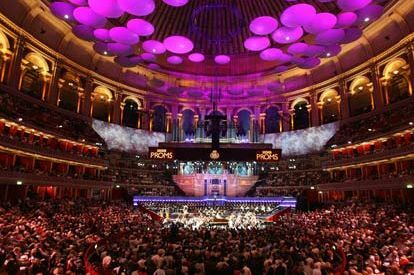 Since the Proms Festival is a high-quality celebration of interesting concert programmes, it's a shame that more imagination was not applied to the programme here. Still, it was good to see such a safe pair of hands as John Wilson come back to the Proms for another musical theatre concert, along with his hand-picked orchestra and previous collaborator Kim Criswell. The other fine singers on the bill were Julian Ovenden, who appeared in the Sondheim Prom earlier in the season; Sierra Boggess, who is currently starring in Love Never Dies in the West End; Rod Gilfry, whose wide experiences as a opera singer and musical theatre performer include appearing in the US tour of South Pacific; and the excellent West End performer Anna-Jane Casey. On one level, this line-up lacked some international star voltage – if we're going to hear movie orchestrations, why not bring in a movie star (or even a top name from Broadway)? – but the singers were all of a high standard. The evening dealt with the shows chronologically and began with the overture from Rodgers and Hammerstein's seminal success, Oklahoma! This was a typical Wilson performance: extremely enthusiastic and virtuosic, but perhaps a little too fast and brass-heavy. Ovenden then came on and sang a very decent rendition of Curly's 'Oh, What a Beautiful Mornin'' which only suffered slightly from a lack of tone at the bottom of his voice. He was then joined by Boggess for the love duet 'People Will Say We're in Love', which was performed with admirable stylistic awareness but a lack of humour and chemistry. The same problem impeded their rendition of 'If I Loved You' from Carousel, which could have been much sexier, and it also needed more bloom at the top of Ovenden's voice. The famous waltz from the same show lacked flow, for my taste, though it was a big-blooded performance. Much better was 'June is Bustin' Out All Over' by Criswell and the superb Maida Vale Singers. Here was a lively rendition of a tricky number, and if the dreaded RAH amplification and acoustics had been better, it would have been even more ideal. Ovenden then returned for the 'Soliloquy', which was perhaps a bridge too far for him: it needed to be larger and more lyrical, and although he projected some of the humour, the psychological shifts in the number could have been more clearly communicated. The highpoint of the concert for me was the South Pacific section, which featured the wonderful pairing of Gilfry and Casey. The latter's performance of 'I'm Gonna Wash that Man Right Out of My Hair' was spot on, with a playful atmosphere and a sense of period performance practice. Perhaps 'Bali Ha'i' was a bit on the slow side, but Criswell's low notes in this song were strikingly rich. The men of the chorus then came on and hit 'There is Nothing Like a Dame' right on the head, with a great sense of humour from the solo quartet. Gilfry took time to warm up with 'This Nearly was Mine', which was overcooked, very bassy and not quite genuine, but he completely opened up with the Twin Soliloquies and 'Some Enchanted Evening', alongside Casey's superb Nellie. They were a fine pairing, and the top of Gilfry's voice here was a revelation, demonstrating some quiet, beautiful singing. I wasn't entirely enraptured with the overture from The King and I, which was too fast in the more tender numbers, and it was almost shocking not to have any more numbers from this tremendous score. On the other hand, it was great to hear something from the less familiar Flower Drum Song. Casey returned for a cheeky, fun performance of 'I Enjoy Being a Girl' and 'Grant Avenue', the latter bringing to life some real party spirit. Gilfry then offered 'You are Beautiful' from the same score, again showing some amazingly delicate singing in the upper register. As noted above, we heard the Rodgers and Rodgers (minus Hammerstein) 'I Have Confidence' and 'Something Good' from The Sound of Music, and in the event they did not particularly suit Boggess's voice because of the low-lying tessitura. 'Confidence' in particular lacked guts and didn't grow, though 'Something Good' once more benefited from the input of Gilfry, who was believable as the Captain von Trapp. Unfortunately, Criswell's subsequent rendition of 'Climb Every Mountain' was less than comfortable and contained some obvious registeral changes. In sum, the concert was a mixed experience, perhaps because the audience was humming along in their heads for most of it (and in some cases, singing along rather audibly). Everyone knew the repertoire before entering the hall and some almost didn't bother to listen. What was lacking for me was an outstanding, arresting performance, in order to justify performing such oft-heard music, and if the Proms are going to continue to programme musical theatre concerts, one hopes they'll go more down the route of inviting world-class international singers to take part, as they do with the majority of the other concerts. Still, when we emerged from the hall after a rousing performance of the title song from Oklahoma!, it was impossible to complain about the atmosphere and entertainment factor.